It’s that time of year again! Thanksgiving dinner and holiday parties with that little request–please bring a dish to share. Someone I know is fond of saying, “Sharing means caring” which makes this holiday request quite fitting, yes? We care about the family and friends we celebrate with, so we share our best dishes, and sometimes, the recipes. Thanksgiving: I volunteered to bring the salad. My family is not full of salad eaters, so I like to choose my salads carefully. The last successful salad I brought to a family function was pre-vegetarian era with macaroni, cubed ham, and two types of cheese. As I have changed, so has my salad choices. I wanted to make a fall salad with fall-appropriate flavors. I had seen this recipe on a favorite blog recently and was inspired by the ingredient list. The family actually ate my salad at Thanksgiving, so I decided to bring it to the family Christmas party the same weekend. It disappeared and a cousin asked for the recipe! (Ok, so there were over 170 people there, so it was bound to disappear.) Still. If you don’t have time to make the dressing, this store bought one is a good stand in. 1. Preheat the oven to 300 degrees. 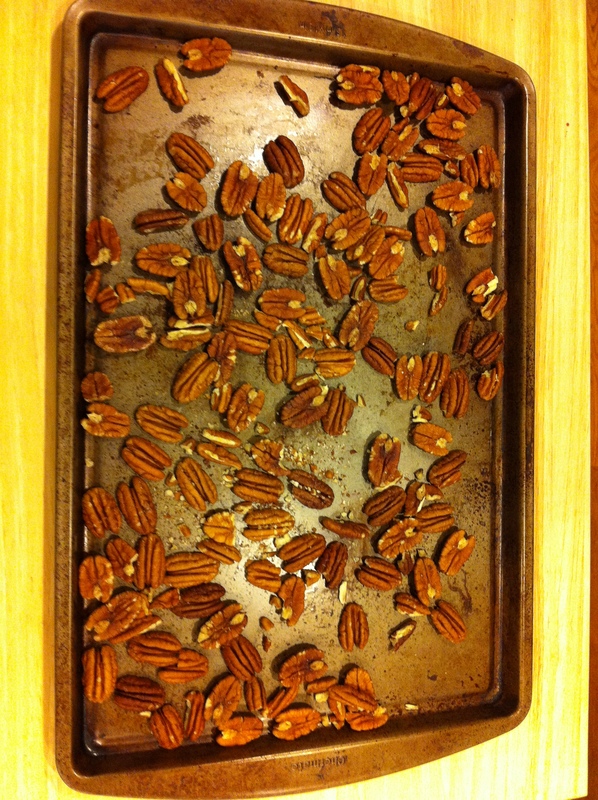 Spread the pecans on a cookie sheet and toast for 8-10 minutes. Remove from the oven and allow to cool while you prepare the rest of the salad. 2. 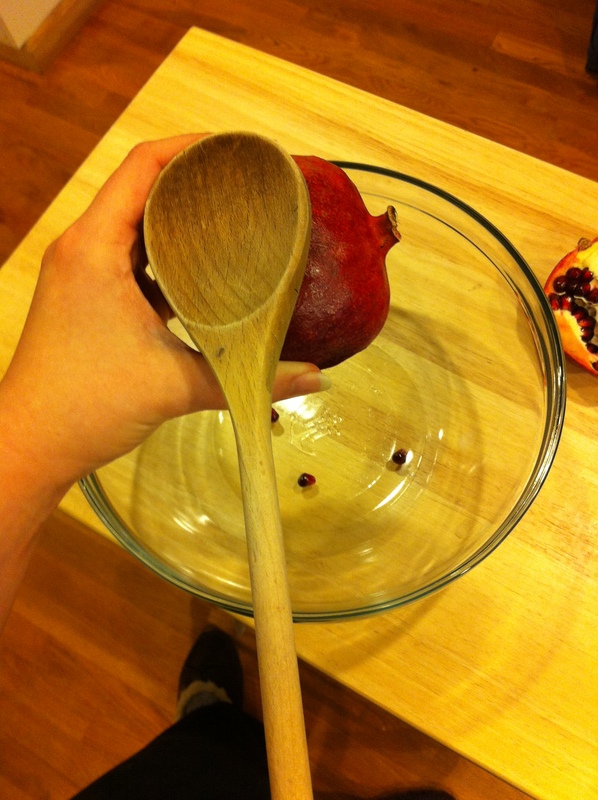 Cut open the pomegranate and remove the seeds. 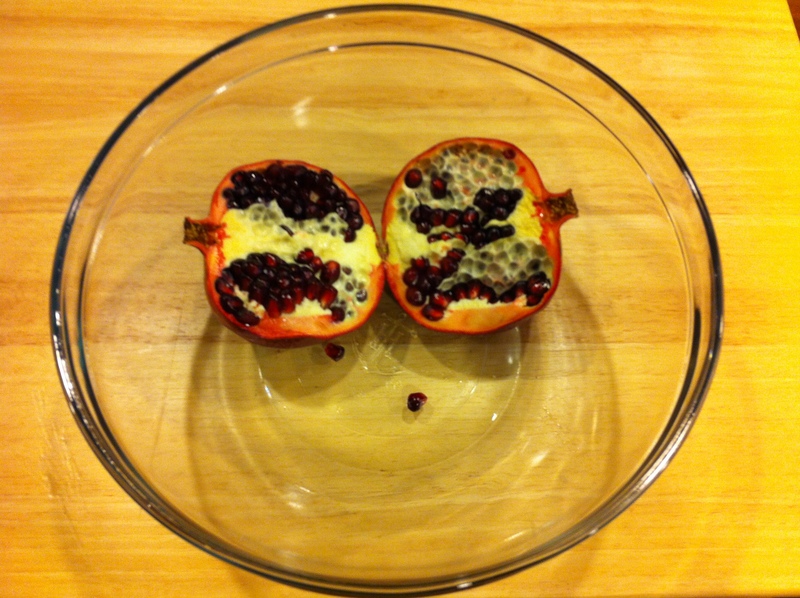 Several websites will give you play by play directions on how to get the seeds out of a pomegranate. Don’t try the wooden spoon method that I saw on Chopped the other night. You end up with only a few seeds popped out and a bruised pinky finger. Not cool, Chopped. I ran with the cut in half just through the skin, break in two, and pop them out with my hands. As long as I’m wearing an apron, the mess is minimal. 3. Prepare the dressing. Mince the garlic (by knife, food processor, or by using pre-minced garlic). Add the lemon juice, olive oil, salt and pepper. Mix in the food processor, or in a glass jar with a tight fitting lid. 4. Put the greens, carrots, and onion in a large bowl and mix together with your hands. Sprinkle the parmesan cheese on top. Add the pecans and then pomegranate seeds on top of that. Dress the salad immediately before serving. Oh that looks delicious and perfectly fall!